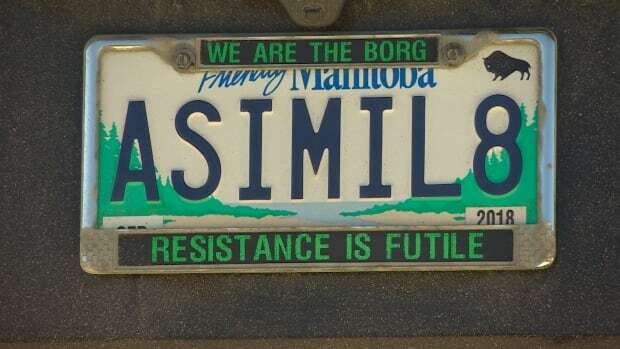 A Winnipeg man is challenging Manitoba Public Insurance in court, arguing the Crown corporation’s decision to revoke his personalized, Star Trek-themed ASIMIL8 licence plate was unjustified censorship. James Kitchen, from the Calgary-based Justice Centre for Constitutional Freedoms, told court his client’s plate was an expression of his interest in the fictitious alien race the Borg from Star Trek: The Next Generation. Troller’s plate was revoked in 2017, two years after MPI approved its use. Kitchen called the removal a “knee-jerk reaction” to social media post made by an Ontario woman on April 22, 2017, complaining about Troller’s plate. Court filings show a transcript of a call the woman made to MPI, in which she said the plate was offensive because of the history of government assimilation policies. Kitchen told court the complaint triggered a series of emails between MPI officials, also included in the court documents, about how the plate got approved in the first place. Licence plates are denied for a variety of reasons, such as being offensive, suggestive or discriminatory, or for including racial or ethnic slang. Since they are the property of the Crown, they can be recalled at any time. The ASIMIL8 plate was considered by a five-person committee. Internet searches on Google and the website Urban Dictionary were done on its meaning and it was issued without any concerns, Kitchen told Court of Queen’s Bench Justice Sheldon W. Lanchbery. Kitchen argued the word “assimilate” is neutral and only offensive in certain contexts, and the Crown corporation didn’t engage in any meaningful deliberation about the plate before revoking it. Manitoba Justice lawyer Charles Murray argued licence plates aren’t constitutionally protected places for free expression, comparing them to other forms of identification, such as passports. He dismissed the argument that the word “assimilate” is neutral in many contexts. The licence plate doesn’t appear in a law journal or a chemistry textbook where it might be innocuous, he argued — it appears on a government-issued product in an area with a history of attempted forced assimilation of Indigenous people at the hands of the government. In light of that context, Murray argued, the licence plate could be harmful to reconciliation. “The court is asked to pit the value of ‘I like Star Trek’ against reconciliation, and find out where the balance lies,” he said. The appearance of the word on a government-issued plate could create the impression the message is coming from the government, Murray said. He argued states have the right to refuse to deliver messages they don’t want to be associated with. “The medium is the message,” he said, quoting late Canadian philosopher Marshall McLuhan. The Justice Centre for Constitutional Freedoms, where Kitchen works, is also representing Lorne Grabher, a Nova Scotia man whose GRABHER licence plate was revoked in 2016 by that province’s Registrar of Motor Vehicles. Grabher’s case will be back in court on April 23. The organization is representing both men on a pro-bono basis, according to a news release issued Monday. Kitchen told the Winnipeg court on Monday that allowing MPI’s decision to stand would place Manitoba on a “dangerously slippery slope” that could stifle freedom of expression. Murray told the court he couldn’t find any other reported decisions where a court was asked to rule on the constitutional protections given to licence plates.